Bloomsbury and its neighboring area of FItzrovia are two areas of London which have retained much of it's charming 18th century ambiance. This is one of my favorite areas of London and I visit all the time. It's a mixture of modern and old together with so much to do locally. The area is known for it's Literary and academic history most notably the Bloomsbury group of writers, intellectuals and artists which met in this area at the beginning of the 1900's. Their members included Virginia Woolf and E. M. Forster. The area is is also the home of one of the worlds greatest museums, The British Museum. However there are many other museums and places of interest to visit in this area of London, as well as many places to eat, drink and have a great day out. British Museum (Russell Street) - One of the worlds greatest museums. 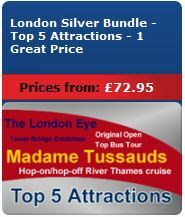 Not to be missed when visiting London. The October Gallery - Contemporary art from around the world. Royal Academy of Dramatic Art - Probably the world’s most famous drama school, their productions are open to the public throughout the year. Address: Malet Street, Somers Town, WC1E 7JN. 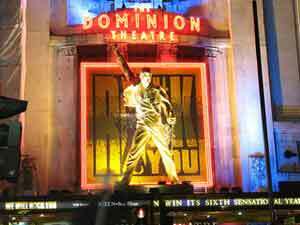 We Will Rock You - Now In It's 11th year. Bibimbab Cafe ( 37 Museum Street ) - Korean dishes, snacks and beverages. Tas Restaurant ( 22 Bloomsbury Street) - Turkish Restaurant. Tea and Tattle Cafe ( 41 Great Russell Street) - Traditional tea room with an Oriental twist. Forum Cafe (62 Great Russell Street) - snacks, sandwiches, jacket potatoes. PizzaExpress ( 30 Coptic Street) - Pizza and Pasta restaurant. Bloomsbury Diner (16 Bloomsbury Street) - Traditional English dishes, sandwiches & snacks. There many more places to eat from simple snack food to sit down restaurants. There are two main shopping streets in this area which are Tottenham Court Road, which is known for it's cut price electrical stores and the famous Oxford Street. 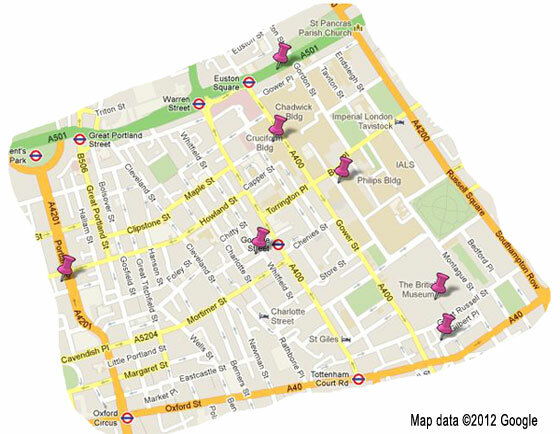 The following are a selection of the smaller shops which can be found in the back streets. British Museum Shop (Great Russell Street) - Books, gifts, souvenirs and replica sculptures and jewellery. Fancy That Of London (48 Great Russell Street) - A wide range of gifts and souvenirs. Coincraft (44-45 Great Russell Street) - antique coins and medals and bank notes. An elegant Georgian townhouse hotel set in the heart of this literary area. A Georgian style, traditional townhouse. Opposite the British Museum. The latest addition to the boutique hotels in the area.